Proactively monitor and query whether patents of interest have been litigated. 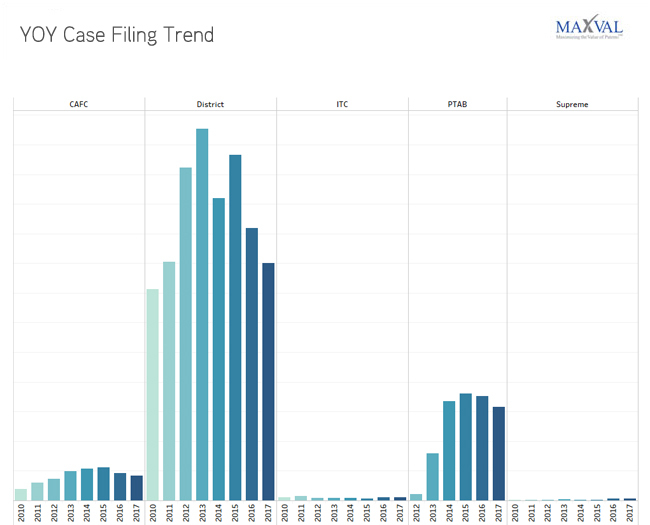 Gain analytical insights on plaintiffs, defendants, filing trends, courts, etc. Stay updated with patent litigation alerts. Mitigate missed opportunities and/or risk of litigation. Instantly assess the potential threat from a patent. Keep up with patent litigation by leveraging technology and analysis. Know how a patent being asserted against you was dealt with in earlier cases. Enjoy cost and time savings. Know litigation threats of a particular industry or a patent portfolio. Obtain industry specific patent litigation data analysis. Get forecast of potential litigation threats. Analyze how a given set of companies are affected by patent lawsuits. Access the outcomes of cases, judgments and orders etc. Study on damage information, injunctions etc. Understand patterns behind how a particular court/judge rules. Receive data reports on various plaintiff and defendant law firms. Query and analyze using over 20 litigation fields including patents, products, plaintiff, defendant, court, judge, law firm, outcome of cases, etc. 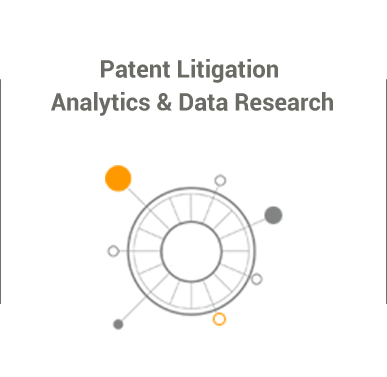 Easy access to complex litigation data without incurring any PACER expenses. Save your analyst effort and resource cost. Access over 0 IP litigations filed since 1980. Explore cases around the Globe from China, France, Japan, Netherlands, United Kingdom and United States. Track cases of your interest by patent, product, party, inventor, etc. Explore cases from US District Courts, CAFC, Supreme Court, and ITC. 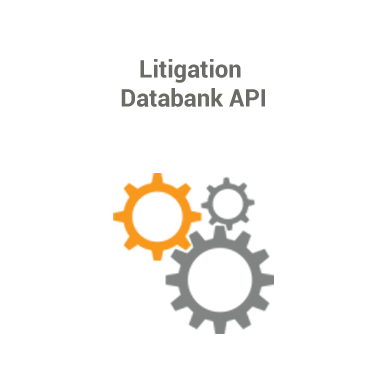 Search databases of ECFs, PACER, ITC, etc. Leverage our technology enabled data analytics and research services. Get complex litigation data analyzed and presented in a simplified manner. litigation database in the market. Facilitate your patent litigation research with the most trusted online litigation assistant by hundreds of law firms, patent attorneys and analysts globally. Make data-informed business decisions with our custom Patent Litigation Analytics & Data Research services. Supercharge your patent database/tools with over 20 litigation fields using our custom API service. Are you investing your precious time and money researching case by case for various trends and derive strategies? Now there’s a better way to get the information you want!!! Transform your business by mitigating risk with our litigation analytics tool, specially designed to retrieve various trends in patent litigation space. 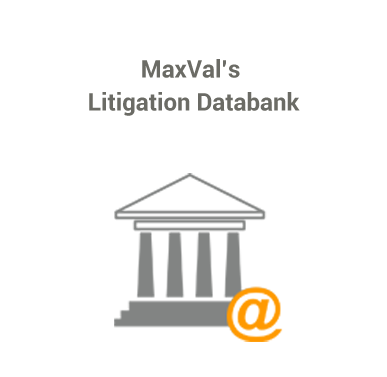 We will provide you with instant insights, assisting you to make faster and better decisions. furthermore focus on key business areas by evaluating the facts. insights of courts, companies, judges, lawyers, law firms, attorneys etc., on demand. Need to know precisely what the patent friendly courts are and perceive the win rates beforehand? Our litigation analytics gives you a pivotal earlier success especially when there is an incline in competition through high-level litigation analytics by court-specific data. Compare every litigation areas and know the impact of filing at various courts to reduce the ability to be permissive. In the year 2013, the number of lawsuits in US district courts increased by 12% from the previous year, although the “America Invents Act” which aimed to decrease the patent infringement which was passed on September 16, 2011. Throughout 2015, Patent Trial and Appeal Board registered the highest number of lawsuits despite the fact that 2014 saw an increase in these numbers by 111% as opposed to 2013. In 2015, the CAFC recorded its highest number of appeals with 556 patent cases in total. 25 cases were heard in the US Supreme Court during 2013, which stands to be the highest number till date. The number of cases filed at the International Trade Commission in the fiscal year 2012 fell by 40%, leading some to wonder if the agency's allure as the latest IP hotspot is fading. In the fiscal year 2016, just 48 cases were instituted, compared with a record of 70 cases in 2017. 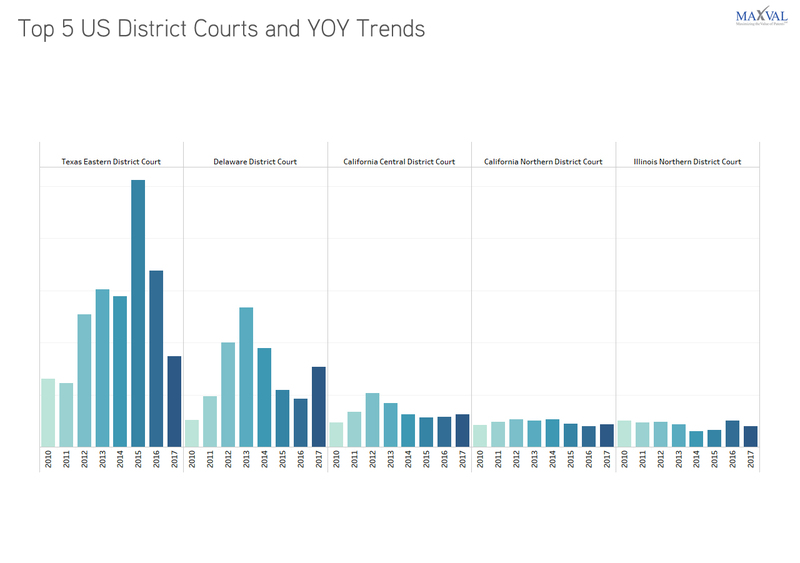 Want to compare district courts performances quickly? Look at the courts based on wide range of factors like procedural duration, probability of preliminary injunctions and much more. You can likewise recognize the litigants, case filing patterns and so forth which can be helpful to strategize and act as a guide for what's to come. Some jurisdictions (Texas Eastern and Delaware) remain favorable venues for patent holders, with criteria such as shorter time-to-trial, higher success rates, etc. 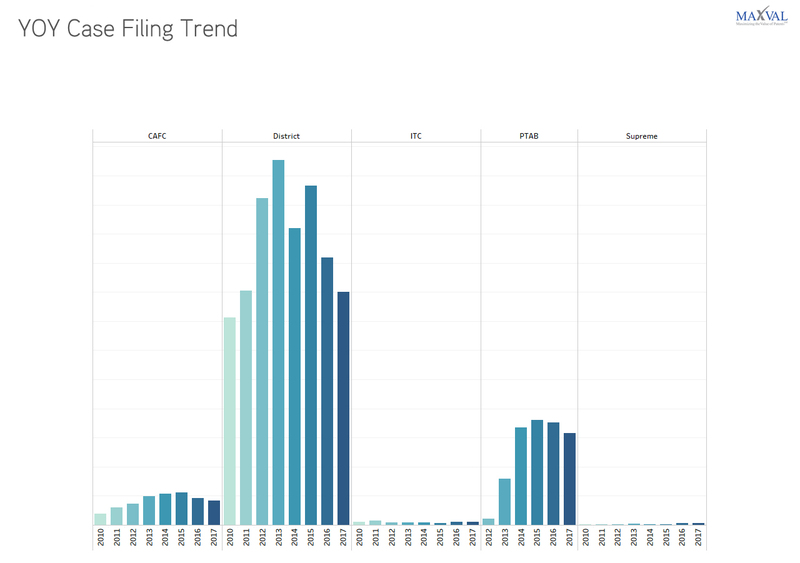 The Delaware District Court shows an increased in number of litigation cases that might have moved to Delaware from Texas Eastern since many firms are registered in Delaware. In need of knowing your rival party’s case history to strategize your action plans? 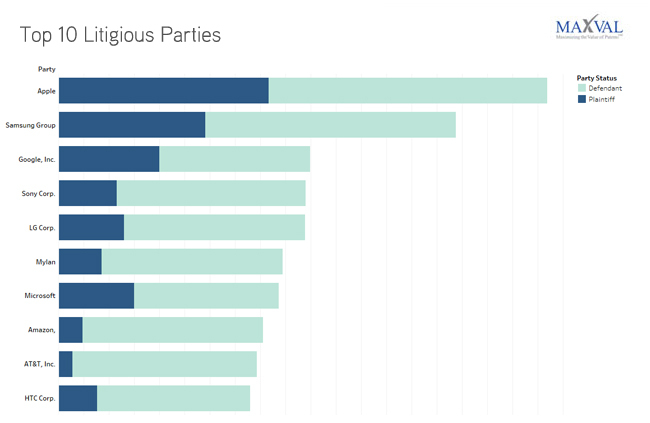 Break down several parties’ background of your interest under particular judges and courts. 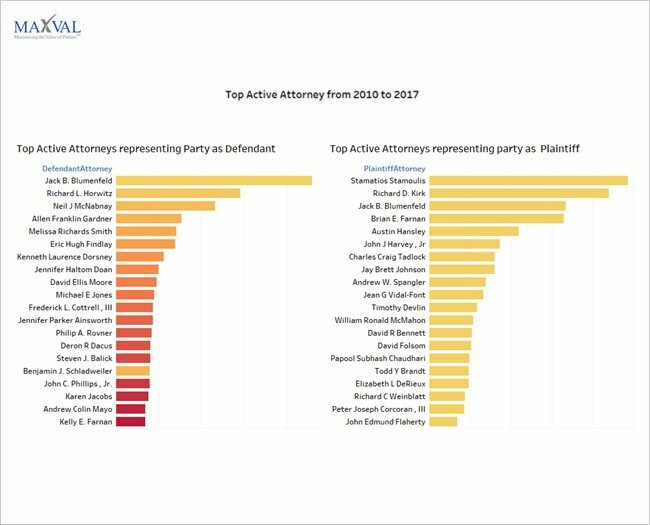 Figure out where the parties tend to file their suit, know the numbers of claims they have been engaged with etc., in minutes. Apple ranks No.1 in terms of the number of lawsuits they are involved in. Apple tops the charts by filing 400+ patent infringement cases and defending 550+ cases. Samsung stands close next to Apple by filing 290+ cases and being the defendant for 490+ cases. The top defendant list then includes a collection of the world’s largest consumer tech firms including Sony Corp, AT&T, Inc., LG Corp, Amazon, Mylan, Google, Inc. and Microsoft. Google, Inc., Microsoft, LG Corp. and Sony Corp have made their presence eminent by filing several patent cases in the year 2017. Do you wish to know top litigated patents in your technology area? Uncover the most aggressively litigated patent or product and know what companies are focusing on as a part of their intellectual property growth strategies. See earlier litigated patents when developing new products and also decide market segments to invest. 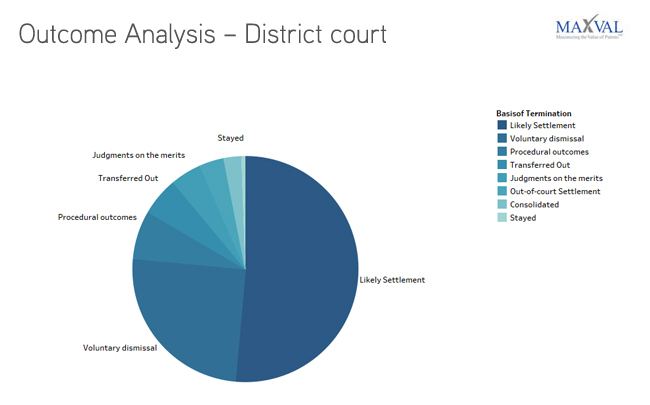 This analysis sheds light to the user to arrive at decisions prior to filing a patent based on their business segment, also analyze outcomes of similar patent infringement cases in this segment. Users can also understand the fact that a powerful patent will survive many battles from the report. The top 3 litigious patents over the years are no longer active were invented by Martin Kelly Jones. US6904359, US7400970, US6952645 are the top litigious patents that were litigated 453, 410 and 325 times respectively. The current assignee of all these patents is Shipping and Transit LLC—formerly known as ArrivalStar, also known as Melvino Technologies, these companies are Non-Practicing Entities involved in the most litigious patent troll. 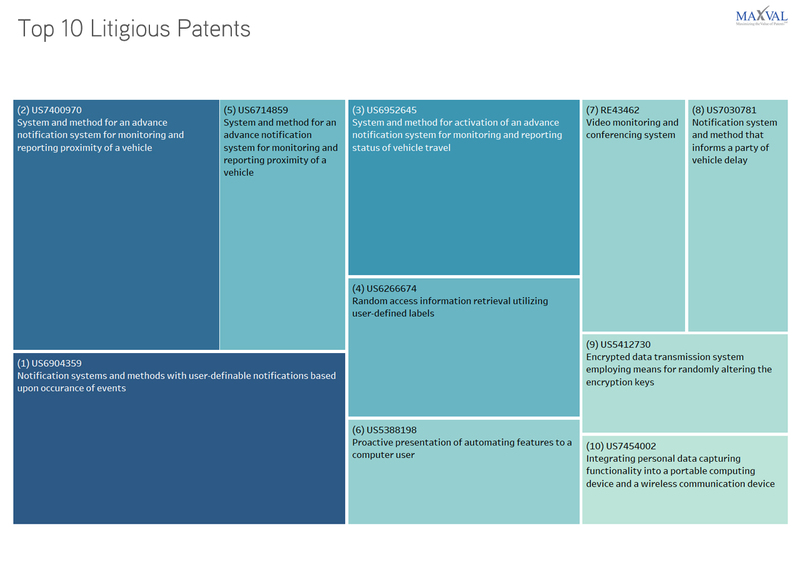 The companies sued for these three patents are from many different industries, including transportation, manufacturing, retail and telecommunications. On July 27, 2015, the patents were assigned to a new entity: Shipping and Transit LLC. The field of invention of the top 3 litigious patents is data communications and information systems and all the three patents belongs to the inventor Martin Kelly Jones which was aimed at vehicle tracking. 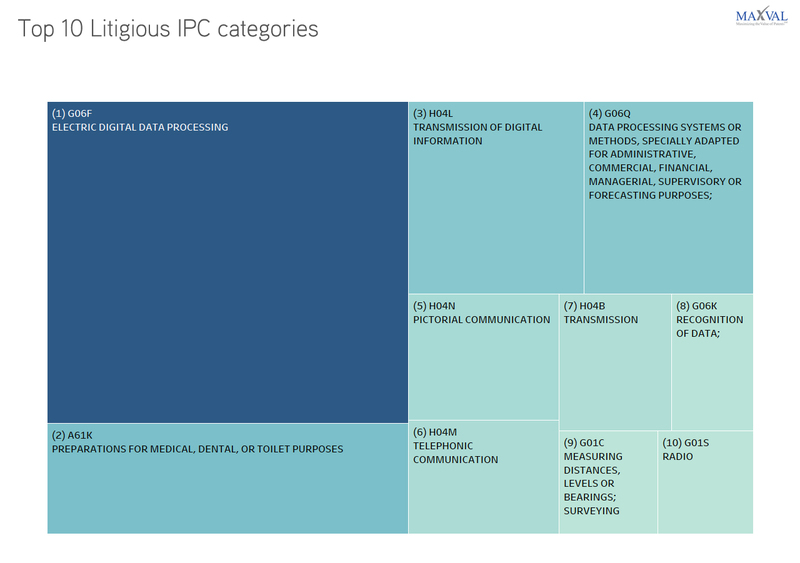 What are the most litigious sectors and their underlying technologies? Decide whether your innovation would be a decent supplement to the current active technology. Identify your target competitors based on IPC categories. This analysis helps the user to understand the trend of patent litigations by IPC category and derive inferences to make strategic decisions on their filings. Also identify the sectors where future investments can be made. 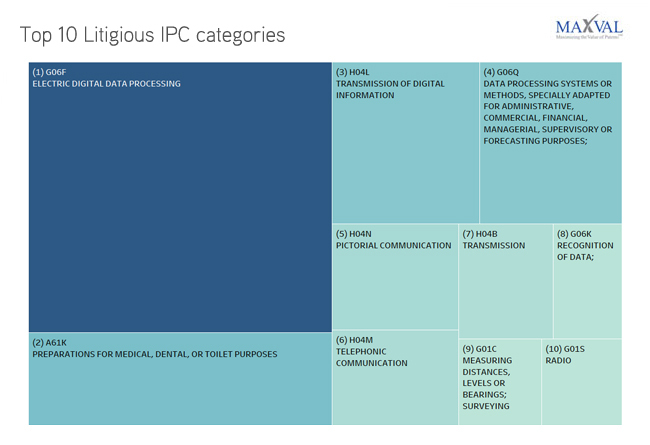 There is a strong representation of software related patterns, due to which we find the IPC category - G06F (Electric digital data processing) to be ranked first in the top 10 litigious IPC categories. G06F is followed by A61K (Preparations for medical, dental or toilet purposes), which confirms the prevalence of patent-litigation in drugs and bio-technology patents. Might want to know insights about action of judges? Figure out various approaches of judges along with the deeper exploration of the cases dealt, average time line and so on. 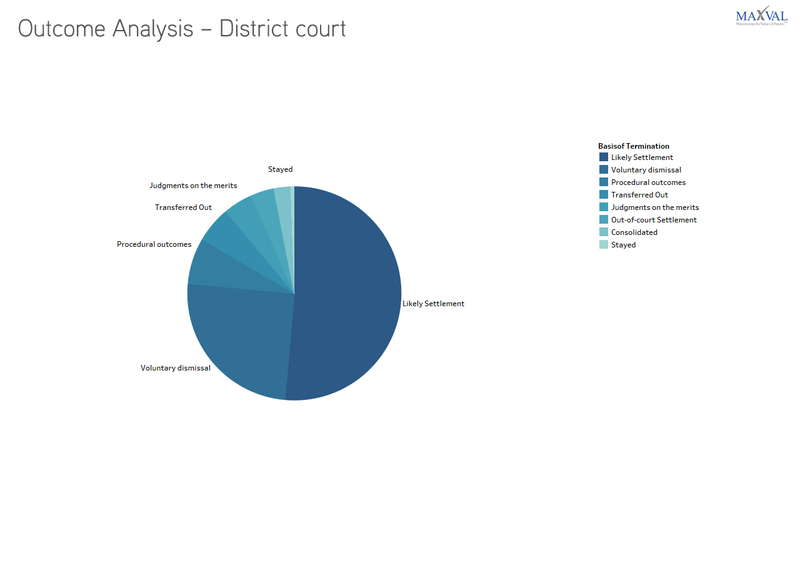 The Judge analytics allows the user to study the trends in the decisions provided by Judges in the respective courts. James Rodney Gilstrap is ranked first as to the single federal judge having to preside over the highest number of filed cases, the highest number of litigants, and the highest number of accusations. 1,276 cases were heard by him in 2016, this is 19% higher than the cases that he handled in 2015. 68% of cases in 2014 and 71% of cases in 2016, handled by Rodney Gilstrap resulted in both the parties agreeing to settle the dispute via court mediation. It is to be noted that Judgments on Merits provided during 2015 & 2016 by Rodney Gilstrap were very low at 0.2% and 0.9% in turn. Robert W. Schroeder is the second most active patent judge in the nation who was also nominated as Well Qualified (WQ) judge by American Bar Association(ABA). His notable patent cases include the VirnetX v. Apple lawsuit, where in 2017 Virnetx won a $302 million verdict against Apple. Want to unleash the outcome based on your business needs? Review the case outcomes, analyze the decision rates like settled, stayed, and dismissed etc., at various court venues. Anticipate the results of the cases which empower you to change the approach and defend from legal attacks. We provide complete analysis of the terminated court cases by turning court data sets into insights and decisions that lead to better legal outcomes which eventually helps in making strategic decisions. In more than 50% of the cases, the parties agreed to settle the dispute via court mediation. Plaintiff requested termination in 24% of total suits held in district courts and “Judgments on merits” were awarded only for 5% of total cases concluded. 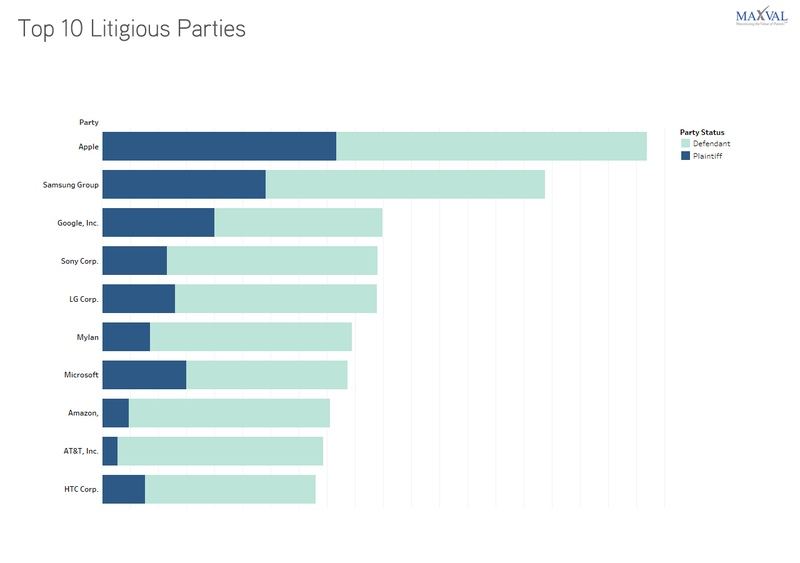 Out of court settlements by parties have increased to around 4% of total cases after 2013.